This essay was written by Brock Dittus. I pull my 2007 Jamis Coda out of the basement and get ready for my ride into work on a dark and slightly rainy Monday morning. It’s been ten years now since I first started working as a school bus driver, and while I spring awake at an early hour, I’m not bothered by riding in the dark. I run a dynamo lighting system that brightly illuminates the road in front of me on my way into work, and got used to wearing a reflective vest so that unsuspecting drivers in the industrial areas (north of Columbia Boulevard in northeast) approaching my workplace can easily see me. On days when it pours I wear my rain pants and rubber galoshes, but this morning I’m just a little damp when I check in with my dispatcher and get the key to my vehicle. I’m not sure if riding my bike up to Pittock Mansion or negotiating narrow streets in a large vehicle is the greater challenge. Driving in the city to transport special needs students on a school bus requires a lot of patience and concentration. 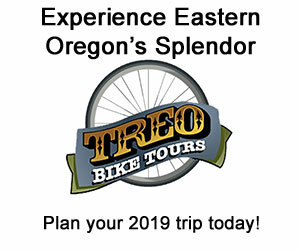 I always travel more slowly than I would in my personal automobile, and I keep an eye out for people on bicycles or in crosswalks as I make wide turns around the corners of intersections. This year my route takes me into the Hillside neighborhood that I first explored while riding De Ronde, and I’m not sure if riding my bike up to Pittock Mansion or negotiating narrow streets in a large vehicle is the greater challenge. I enjoy both, however, knowing that I’m playing my part to keep our streets safe for all users. I pull up to my first student’s house and greet him as he climbs the stairs to his seat. The program I drive for serves students from ages 18 to 21, preparing those with special needs for the transition from high school to adult employment. We roll into the loading zone and friendly staffers greet each student by name. I unfold the wheelchair lift and assist one of my students in his arrival to school. I’ve driven for nearly every program in the district now, including elementary and middle school programs, as well as alternative schools for those needing a more intentional education plan. I’m often thankful for the opportunity this job allows me to connect with a broad range of families, students and staff of diverse backgrounds and cultures. As I wait to cross the river on the Broadway Bridge I take note of the people on bicycles that I’ll have to watch out for as I merge lanes. My students listen to the jazz station and look out the window at the world around us. Sometimes we converse about the things they see there. After the last student gets off at their stop, I pull to the curb, get out of my seat to check my phone for evening traffic conditions, and aim for the fueling station. Once my day is done, I unlock my bike and point it south for the trip home. While it’s been a tiring day, I think to myself how lucky I am to have a job that I love. 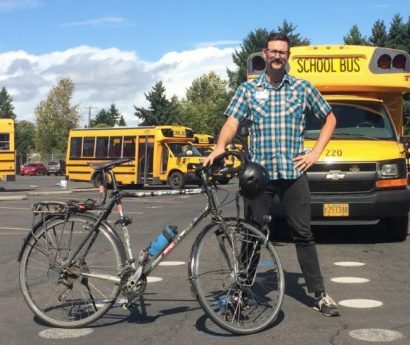 — Brock Dittus is a school bus driver trainer for Portland Public Schools’ Student Transportation department. He also produces The Sprocket Podcast, a weekly talk show about bicycling and adventures. If you’re interested in being a school bus driver, check out our recent PPS job listing.